I've recently been searching the Web for the perfect little subway art printable to frame and put up in my kids' room. 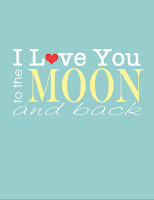 I like some of the "I love you to the moon and back" printables that I've seen, but nothing's quite been the way I wanted it (no offense to those of you who have been creative enough to make some of these--they're so cute!!). My DS really likes the book that quote came from: Guess How Much I Love You . I wanted a slight pop of red, and a little bit of yellow, with a blue-ish/green-ish background. So, I sat down and made my own this evening! I love it! I can't wait to pop it into a white frame and hang it! Yay! PLEASE READ: I have made this printable FREE and available for your PERSONAL use only. Please, do not sell it or redistribute it. If you would like to share this free printable, please send people to this post. Thank you so much!